In the U.S., Apple has temporarily called a halt to in-store shopping reservations for the iPhone 7 —but those will reopen at 8 a.m. on Sept. 17, potentially giving people who missed launch-day preorders another shot at getting a device within the next two weeks. The option lets people reserve an iPhone online, then pick it up at an Apple store within a fixed 30-minute window. Otherwise, people wanting a device at retail may have to line up at an Apple or third-party vendor's store on the morning of Sept. 16, hours in advance of the company's 8 a.m. go time. 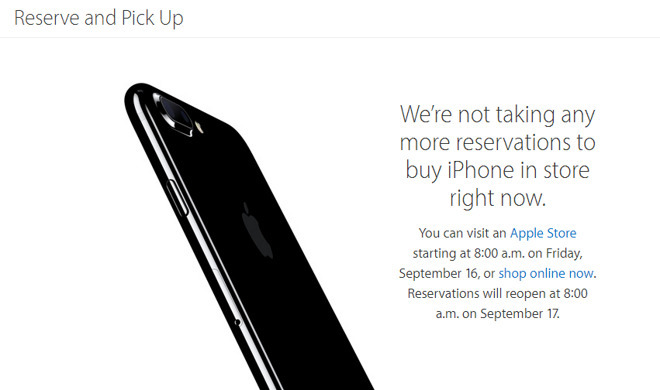 In the U.K., meanwhile, reservations will resume on Sept. 17 at 6 a.m. Canadians can still make reservations for Sept. 16, but some models may be out of stock, depending on the store a person chooses for pickup. Slow presales may be attributable to the cost of an iPhone in the country —prices range from $899 CAD all the way to $1,309 CAD for a 256-gigabyte iPhone 7 Plus. Delivery times for American online orders are already stretching out to 2 to 3 weeks, with some potentially arriving as late as Sept. 28.